From its humble beginnings as Game Reserve No3 in 1907, the Namib Naukluft Park has grown to become the largest game park in Africa and the fourth largest in the world. Throughout the years, more and more tracts of land have been added to this reserve. Sandwich Harbour (1941) was the first addition, then Kuiseb Canyon, Swakop River Valley and Welwitschia plains (1956) were incorporated to form the Namib Desert Park. Next, Diamond Area No 2, including Sesriem and Sossusvlei was linked up in 1979 and this 49 768 km2 area of wilderness was renamed the Namib-Naukluft National Park. The combination of all these diverse areas has made Namib-Naukluft one of the most spectacularly scenic places in all of Namibia. The endless magnificence of this national park makes it a great favourite amongst photographers and nature lovers alike. The impressive Naukluft Mountains tower over the eastern reaches of the park, their high plateaus and rocky slopes dotted only here and there with a few bushes. In between, these lofty peaks lead down to lush valleys filled with animals and birdlife. Serious hikers love the challenge of these undulating surfaces and the area is known for its excellent hiking trails. Hartmann’s zebra, rock hyraxes and klipspringer are at home on this harsh mountainside while gemsbok, kudu, klipspringer, springbok and ostrich inhabit the valleys and plains below. Birds are abundant, with over 200 species recorded, including Rüppell’s parrot, rosy-faced lovebirds and Monteiro’s hornbill. Black eagles, lanner falcons, augur buzzards and pale chanting goshawks soar on the currents above while hamerkop, brubru and other water-loving birds are common in the lush valleys. 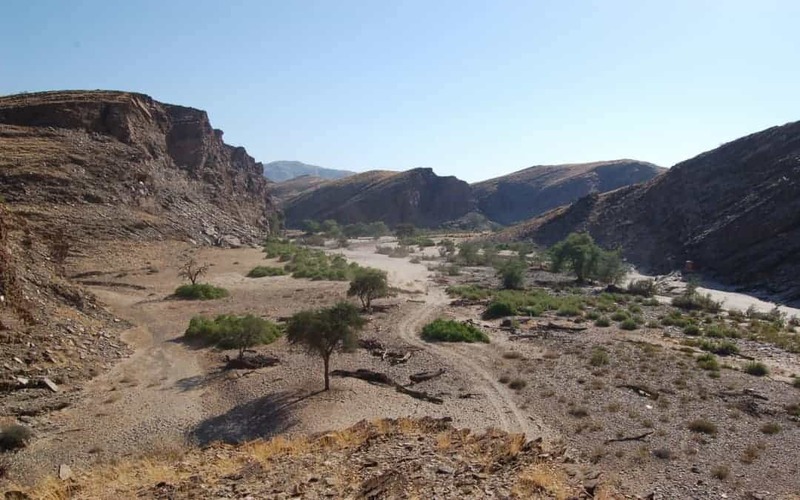 Close to the entrance of the park, lies the Sesriem Canyon, so named by the early settlers because it is six lengths of hide rope (riems) deep, about 30m. They figured this out by trying to harvest water from the pools at the bottom of the canyon. These pools are heavily dependent on the rains and may be stagnant at times. During good years they are a great place to dip your aching feet after hiking down the canyon to reach them. This is one of Namibia’s most photographed areas, featuring huge orange dunes and the eerily beautiful Dead Vlei, where dark 500-year old fossilised trees poke hauntingly out of the white salt pan below. Sossusvlei and Sesriem epitomise the classic Namib landscape with enormous dunes for climbing to survey the vastness below and perhaps spot a lonely oryx or forlorn acacia tree on the horizon. Both areas border on the Tsauchab River, which still cuts a swathe through the sand sea. The area is dotted with green camelthorn trees which survive on underground water as they wait patiently for the next rains. Very rarely, this part of the world receives torrential rain, causing a torrent of water to rush down the Tsauchab towards the distant Atlantic and filling the lower reaches of the Sossusvlei. Suddenly the area fills with life. Long dormant lilies bloom, new growth spurts from the acacias and the birds return. These waters can remain in the Sossusvlei for months attracting wader and water birds, while just over the next dune, the landscape remains as lifeless and waterless as it has always been. In the north of the Namib-Naukluft National Park, the Welwitschia Trail offers a chance to wander among these lifeless tracts in search of one of the world’s most unique plants. Follow the beacons to view these amazing alien-looking bushes with their curling strap-shaped leaves, some of them over a thousand years old. The Namib-Naukluft is a place of fascinating contrasts, interspersed with areas of lush abundance among the towering granite inselbergs and hot desert sands. It is these contrasts that lure visitors to explore, enjoy and draw inspiration from this vast and fascinating destination. Put the Namib-Naukluft National Park right near the top of your wish list for your trip to Namibia – you simply have to see it for yourself.